Reference: Spitz DB, Clark DA, Wisdom MJ, Rowland MM, Johnson BK, Long RA & Levi T (2018) Fire history influences large-herbivore behavior at circadian, seasonal, and successional scales. Ecological Applications. DOI: 10.1002/eap.1797. Recently the news has been dominated by the ravaging wildfires in California. The fires have burned nearly 250,000 acres of land and affected thousands of families. The size and intensity of the Camp Fire and Woosley Fire are unprecedented. However, the severity of these fires is something we may anticipate in the future. There has been a worldwide increase of wildfires; and as climate change and human activities intensify so will the fires. 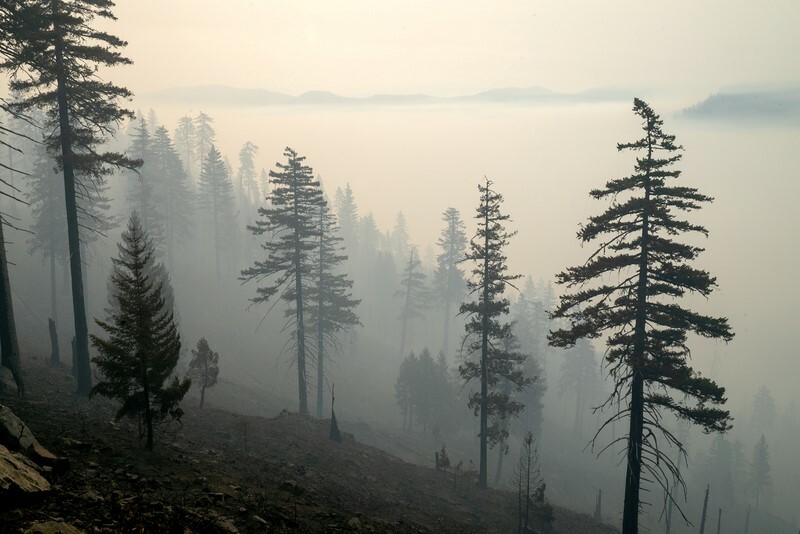 How plants and animals cope with wildfires has fascinated ecologists for decades. Pivotal to the field of ecology, understanding how the environment influences the distributions of species may improve our management and wildlife. Recent research led by Dr. Spitz at Oregon State University attempts to describe how elk utilize land affected by wildfires. Wildfires are a natural fixture for many environments. In fact, forest managers have recognized the important role fire has in the natural cycle of a forest. Increasingly there is a shift from fire suppression to strategies like prescribed burning. Fires open up landscapes and allow young shrubs and saplings to grow in what would otherwise be a forest of old, dead trees. The generation of younger, lower plants provide an excellent source of nutrition for many herbivores. Open areas produced by fires or disease also limit opportunities for ambush predators to seize herbivore prey. For over 21 years, Spitz and colleagues collected data on where female elk were traveling in an experimental forest in Oregon. Scientists gathered spatial data of the elk via collars. After five years, forest fires altered the forest and subsequent elk distribution. To understand how fires affect distribution of elks, the scientists followed the movement of the elks for an additional 15 years. The elk strongly preferred burned areas when the seasons and time of day were right. During the spring and early summer, the elk spent the most time in burned areas. At night, the elk were able to access the highly-nutritious shrubs and saplings of burned areas without exposing themselves to high daytime temperatures. As the season progressed, the vegetation began to die and the elk spent less and less time by recently burned habitats. Spitz and colleagues didn’t find strong patterns of elk distribution during the day. How Do Elk Respond to Fire? Most studies only focus on the first five years post-burn but Spitz and colleagues recognize that it takes much longer than five years for a forest to recover. However, the elk utilized burned areas heavily in the first five years and less so as the vegetation began to regenerate. They were able to establish that elk tended to “commute” to burned areas during the early summer and at night. Understanding how animals utilize recently impacted habitats could help manage populations that are of concern or improve hunting regulations. Elk, and other herbivores, use a wide range of habitat types during their lifespan. Preserving a diverse set of habitats could greatly benefit many plants and animals. Once everyone is safe from wildfires, maintaining a diverse set of habitats when managing fires may benefit a wide array of wildlife.